In the mid 19th century, a group of schoolboys in flannel shirts began to play cricket in a Germantown pasture. Because of the alcohol and gambling that it attracted, locals shied away from the sport, and they knew very little about the game. Still, the boys’ matches seemed innocent enough and passersby occasionally stopped to watch. As the few spectators became crowds, the games’ fans outgrew the seating: the white fence along the pasture’s edge and six folding chairs for the women who attended the matches. An American cricket legacy grew from these humble beginnings. For years, The Germantown Cricket Club has been a staple of Germantown culture. Originally founded in 1854 and incorporated in 1880, the club has served as a recreation center and community meeting place. Described as an “international ambassador,” its reach has extended well beyond Germantown. The club’s participation in national and international sporting events established its reputation across the globe and it continues to attract and impress visitors from New York to Pakistan. English immigrants first brought the game of cricket to Germantown in the late 1700s, but Germantown’s upper-class residents remained entirely unaware of the sport’s presence in the community until 1830. Once they did notice the sport, they scorned it. William Rotch Wister was the first of Germantown’s elite to express an interest in the sport. He began the first American team at the University of Pennsylvania in 1843. In 1854, he founded the Philadelphia Cricket Club, which encouraged other clubs to form and further advanced the sport in Philadelphia. Inspired by William Rotch Wister, some of his younger brothers and cousins gathered a number of their friends together and began to play in William Wister Sr.’s cow pasture, Belfield. This group of twelve- to fourteen-year-old boys organized The Germantown Cricket Club on August 1, 1854. The Wister family and Thomas Newhall, whose older sons played on the team, provided the supplies for the group. The boys’ young ages kept both alcohol and gambling away from their matches, and the community easily enjoyed their wholesome games. The Germantown Cricket Club met its first and greatest rival in the Young America club. The members of the Germantown Club created an age requirement specifically to exclude the players’ younger brothers from joining the team, and they retaliated with the so-called “apple-barrage” in 1855. During a June match, the younger group snuck up on the Germantown Cricket Club, whose batsman stood in front of his team’s wicket, which tragically lay between two apple trees. Grabbing as many apples from the trees as they could carry, the younger boys rushed the game and pelted the players. Still burning with passion, the aggressors formed the Young America club on June 14, 1855. 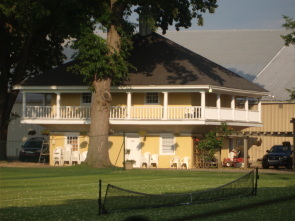 The Newhall family claimed the largest share of the group’s members and supported the team, leaving The Germantown Cricket Club under the care of the Wister family. The teams’ rivalry remained fierce as each team had vivid memories of the ‘wrongs’ done to them. However, the mood lightened before too long, and the clubs combined their ranks to play a “Family Match” with the Wister and Newhall families. Although the relationship between the clubs became more relaxed, their competitiveness did not, and the teams continued to play heated matches against each other. The Civil War suspended The Germantown Cricket Club and nearly all other area cricket clubs in 1861. A wave of patriotism swept through Philadelphia’s Unionists after Confederate troops fired on Fort Sumter. When Lincoln publicly called for volunteers, the Germantown cricketers rushed to enlist. Young America survived only because its members were too young to enlist in the army. Instead, they became responsible for keeping Philadelphia cricket alive during the war. Walter S. Newhall, one of the founding members of the Germantown Club, organized a cavalry company with his fellow club members and other Germantowners. The group offered William Rotch Wister the captaincy, which he accepted, and training began. With very little demand for cavalry at the beginning of the war, however, the unit’s members split up to join other squads. The soldiers’ friends and family credited cricket with having prepared them for war. When they enlisted in the Union Army, they already exhibited the “physical and moral tone” required for military duty. Characteristics including physical fitness, perseverance, and discipline, all “qualities needed for a good cricketer,” were byproducts of the games they played. The soldiers reluctantly decided that the risks of injury and the amount of energy needed to play the game conflicted with their interests in the army, and they left the game behind. Whenever they had leave time, though, the players made sure to play a match. After the war ended in 1865, one of the original members, Charles Cadwalader, reorganized The Germantown Cricket Club. The group unanimously voted to re-form the club, and before the club played a single match, its membership quickly doubled its previous record. Philadelphia’s General George Meade, who led the Union to victory at the Battle of Gettysburg, personally opened the club’s new grounds at Nicetown in a widely attended event. The members of the Young America club formally and warmly welcomed their brothers back into the world of cricket. Both The Germantown Cricket Club and Young America called a number of locations home before settling at their current location. Before the war, the Germantown Club played at various properties owned by William Wister. When the club reopened at the Nicetown Grounds, Cadwalader boasted that the grounds southwest of Wissahickon and Roberts Avenues were “unrivaled for the beauty of its situation and environment.” Cricket enthusiast Henry McKean generously furnished the grounds for free. His contribution allowed Germantown to avoid the fate of smaller clubs that could not afford their own grounds and consequently dissolved or merged with other clubs. The Germantown Club gradually absorbed many of these clubs after hosting them at Nicetown. The grounds were the first of either team’s with a grandstand, and Nicetown hosted numerous international matches with professional teams from Australia, England, and Canada. Young America had its own grounds during this time as well. The group met in Thomas Newhall’s backyard at Walnut Cottage until 1856, when it moved to the Turnpike Bridge grounds near Stenton Park. Turnpike Bridge served as the team’s home for twenty-two years, but the construction of a railroad cut through the grounds and forced Young America to move a block east to the Stenton Grounds in 1879. The club stayed at Stenton for another decade before it lost its independence. When cricket’s popularity began to fall in the late 1870s, Young America suffered financially. 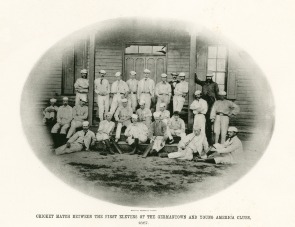 The members of The Germantown Cricket Club, where cricket still had a strong following, recognized the immediate threat that Young America faced, and in 1889, the two clubs voted unanimously to allow Young America to join The Germantown Cricket Club, which adopted Young America’s colors and relocated along Manheim Street. The club obtained 10.5 acres of land for its current grounds and fitted it out extravagantly. The internationally famous McKim, Mead, & White architectural firm, which designed the New York Public Library and the wing additions to the White House, designed the new clubhouse. The Club described it as having “unusually comfortable quarters” for “bathing, dressing, and lounging,” which a separate dormitory building later supplemented. 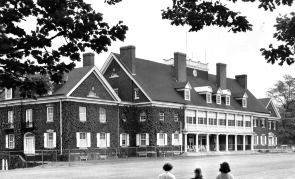 Two additional wings extended the clubhouse in 1903, and the club added buildings that housed bowling alleys and squash courts. In 1893, the curator of England’s Royal Kew Garden described the club’s grandstand as “the only structure of the kind…which possesses any claim to artistic merit.” It overlooked the cricket field and “a better laid-out ground than any [the curator had] seen in England.” A special Ladies’ Club House provided a home for the women of the club. As in the Civil War, the Club played an active role in later wars. When the United States entered World War I, the Club created a “Preliminary Infantry Drill Training Course” to train draftees for service that gained the “hearty approval of government authorities.” Using its own funds, the Club purchased five hundred “state-of-the-art” rifles and hired more than fifty instructors for the program. For the morale of troops and citizens alike, the grounds opened to the public on drill days. Troop entertainment dates back to Young America’s games at Stenton. Civil War veterans gathered from an Army hospital established near the club’s playing field and enthusiastically cheered for the team when it played against English opponents. 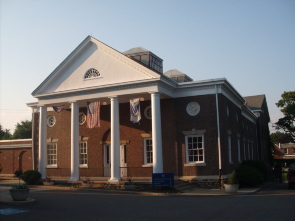 During World War I, the Germantown Club entertained approximately one hundred sailors and marines each Sunday and held similar events during World War II. Exhibition tennis matches raised money for both war efforts. Today, tennis dominates at Manheim. 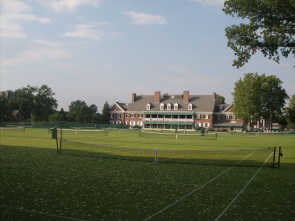 The club has twenty grass tennis courts, twelve clay courts, two additional Har-Tru clay courts, and a complex with four indoor courts. 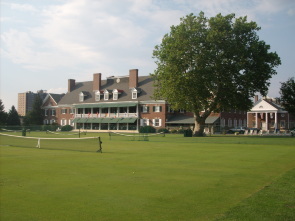 As cricket declined, tennis took its place, and in 1921, the club decided that “cricket should be played only when it did not interfere with tennis.” Interest in tennis grew steadily after the Club introduced its first tennis courts after opening at Manheim, but its popularity reached a climax when club member and international tennis champion Bill Tilden won both the U.S. National Championship and Wimbledon in 1920. During the tennis off-season, the club converts the grass courts into a cricket pitch that still attracts international competitors. The club also boasts a fitness center, outdoor swimming pool, and a squash facility that houses eight courts. 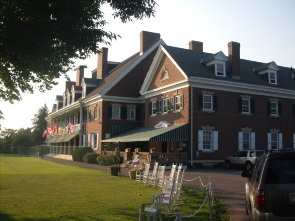 The National Park Service officially added The Germantown Cricket Club to the National Register of Historic Places in 1987. "The Game of Cricket When and How it Was Started in Germantown In Charge of Mr. George M. Newhall," Reminiscences of Old Germantown M. CM. 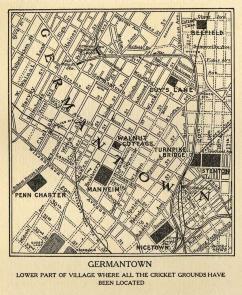 XII., (Germantown, 1912), FLP 27-22, Pamphlet Collection, Urban Archives, Temple University, Philadelphia, Pennsylvania. Cushman Newhall Scrapbook 1891-1898, C. C. Morris Cricket Library, Haverford College, Haverford, Pennsylvania. Cadwalader Family Papers (Collection 1454), Box 522, Folder 2, The Historical Society of Pennsylvania, Philadelphia, Pennsylvania. Charles Blancke, "The International Cricket Match at Manheim," Harper's Weekly, vol. 36, issue 1869, October 1892, 991-992. George M. Newhall, ed., American Cricketer, vol. 1, (Philadelphia, 1877). Horace Mather Lippincott, A History of the Philadelphia Cricket Club 1854 to 1954 (n.p., 1954). John A. Lester, ed., A Century of Philadelphia Cricket (Philadelphia: University of Pennsylvania Press, 1951). Russel F. Weigley, ed., Philadelphia A 300-Year History (New York: W.W. Norton & Company, 1982), 331-332. Sarah Butler Wister, Walter S. Newhall (Philadelphia: n.p., 1864). The Germantown Cricket Club, 100 Years of The Germantown Cricket Club (Philadelphia, 1954). The Germantown Cricket Club, Annual Report of the Germantown Cricket Club (Philadelphia, 1904-1924), C. C. Morris Criket Library, Haverford College, Haverford, Pennsylvania. 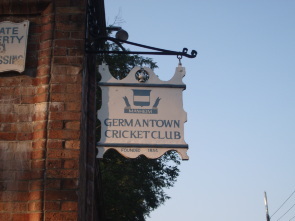 The Germantown Cricket Club, The Grounds of the Country Club : A New Home for Germantown Cricket. (n.p. 1915) FLP 28-18, Pamphlet Collection, Urban Archives, Temple University, Philadelphia, Pennsylvania. William R. Tucker Correspondence (Collection 136), Box 2, "ga—ge", The Historical Society of Pennsylvania, Philadelphia, Pennsylvania.